It is recommended that you only fly this site if you are at least P Rated. Experienced CP pilots may fly the site but it is strongly advised that they are with an experienced Codden pilot and have had a thorough pre flight briefing. It is also recommended that any pilot who has not flown the site before regardless of ratings seeks the advice of a local experienced Codden pilot before flying the site. The site is near Barnstaple. Drive south from Barnstaple on A377. Turn left opposite filling station at Codden Hill Cross, signposted Cobbaton/Chittlehampton. Follow this road and continue past the Codden Hill Equestrian Centre. Continue on until you come to the signpost Horswell/Broadmoor. There are two parking options: 1. The main car park is located on your left opposite the signpost Horswell/Broadmoor. This is ideal for PG Pilots. You can park and walk up the back side of the hill towards the gate located near the Monument. 2. For alternative parking continue onwards on the road until you reach the signpost for Hayne/Downrew. Take the opposite left turn onto the gravel road leading upwards towards the car park and access to the hill. Please make sure you close all gates behind you. Takeoff is anywhere behind the path at the front of the hill. Is located in the takeoff field only. In the fields to the right of the farm in front of takeoff and as near to the gates and paths as possible. HG pilots should inspect before flying. There is an alternative landing area for HG Pilots to the left of takeoff. See map for details. 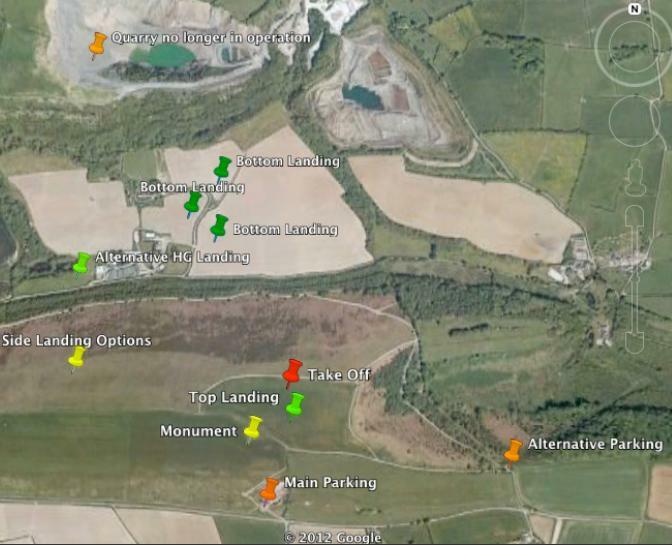 To retrieve, drive round to front of hill to the field which is by the road next to the quarry.PG side-slope landing easy. Good -100K is possible. Please make sure you avoid all airspace. If you are not familiar with where to avoid please phone in advance. Thermals can be very strong so take care. Be aware of the sea air effects that can come in very quick in spring/summer months at around 12:30PM. It can get windy and rough due to the effects of the estuary accelerating the wind. If it feels too strong do not fly the site. A general Meteo guide is that 5-10mph is steady and good for PG Pilots. 10-12mph fly with caution for PG Pilots and a good strength for HG Pilots. It is advised that 10mph meteo is the max recommended strength for PG Pilots. It is advised that 14mph meteo is the max recommended strength for HG Pilots. Both PG & HG Pilots be aware of strong lift and sink. It’s also advisable for HG Pilots to fly with a little extra airspeed to maintain control as conditions can be rough at times in this wind strength. In nice light conditions Codden is amazing so don’t be put off but please have massive respect for the site. When going XC it is advisable only to leave the hill in an established climb as the hill drops away at the back & you will encounter rotor if too low. There are also pylons that you should be aware of not that far away down wind. It is advisable that you have sufficient height when committing to leave the hill. Codden Hill is predominantly an XC site and it is not really recommended to just hang around soaring it. Nearest Phone: Bishops Tawton. Dogs are allowed on the site but must remain on a leash at all times and no fouling. No camping is allowed on the site. Please note that the Quarry is no longer operational. Acro, or radical manoeuvres are strictly prohibited if you are within 500 feet of any other person, in the air or on the ground. This is in accordance with the Air Navigation Order, (ANO CAP 393, sec 2, page 6, March 2007). Any manoeuvre which, if it went wrong and could contravene the above rule, is also prohibited. An example of this is: A deep spiral directly over other persons, but greater than 500 feet away, that, if it became unrecoverable could impact those below. If you are intending to travel and fly at Codden Hill, please ensure you call the Low Flying Booking to register a CANP before 8pm the evening before. 0800 515 544. There is a local Air Sea Rescue Helicopter that regularly covers this area so a CANP is mandatory.